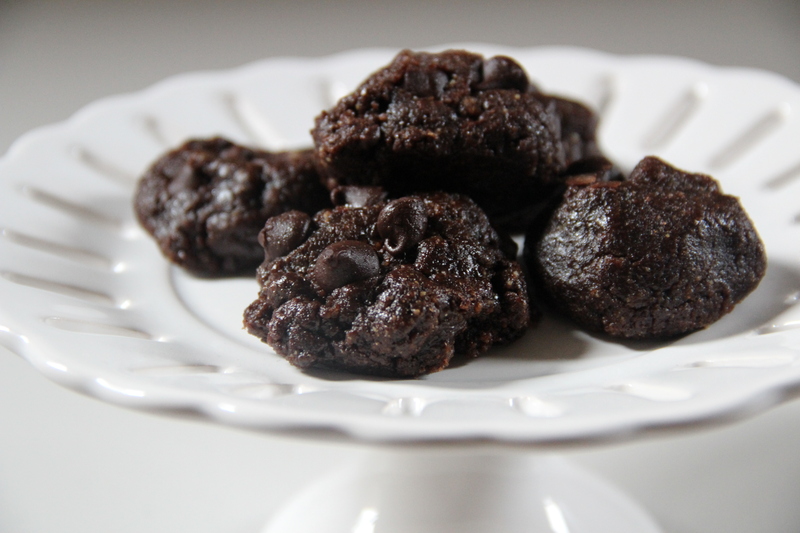 Double Chocolate Chunk Cookies are fudgey, brownie and cookie-like all at once. You’d never believe they’re free of many common allergens, including gluten, dairy, and can easily be made free of eggs and tree nuts. Cookie photos by Kristen Joerger of tiny-gourmet.com . 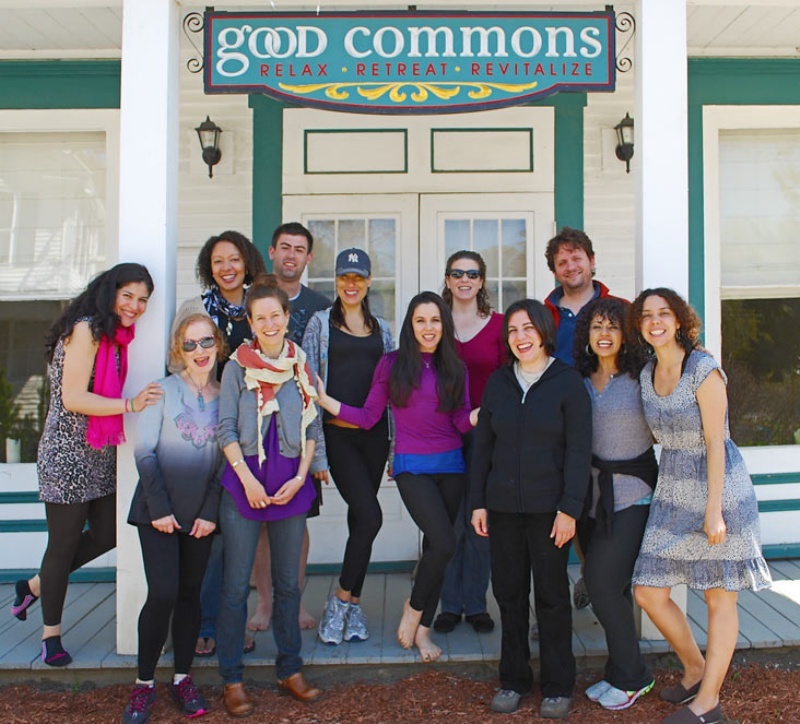 They were a huge hit at my most recent yoga retreat. People always request this recipe, yet I always got sidetracked. This magic batter traveled with me to my most recent yoga retreat, and the cookies were a huge hit when we packed them into the bagged picnic lunches we took with us to the apple orchard. These cookies are packed with flavor and a beautiful texture. Bria’s Double Chocolate Chunk Cookies. Yield: About 2 dozen cookies. 2. In a nice, roomy mixing bowl, cream together peanut butter, brown sugar, egg, and vanilla. 3. 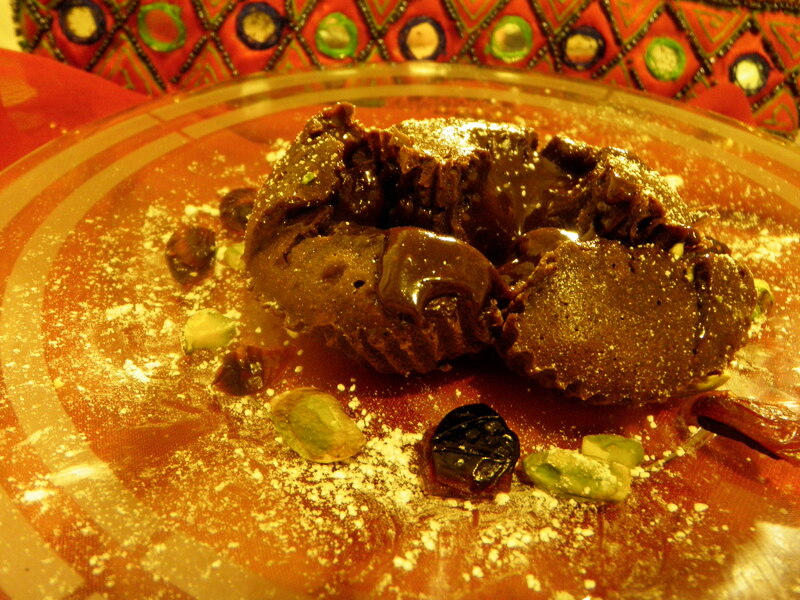 Begin adding in cocoa powder, 1/4 cup at a time, and mix until well incorporated and moist. If the batter gets too dry, add in bit of water, leftover coffee, or milk of choice to loosen it. Then remix. If batter becomes too loose, add in more cocoa powder to tighten it up. 4. Fold in 3/4 of the chocolate chips and/or chunks. Save the rest for garnish. 5. OPTIONAL/not always necessary: Stash mix in the freezer for 10-15 minutes while you prepare your cookies sheets. I either line mine with parchment paper, or spray them with cooking spray. One of these days I WILL get a Silpat. 6. Use a cookie scoop or a spoon to make uniform sized dough balls. (I do this by hand and spoon, and each cookie is a generous tablespoon of dough). Do NOT smash cookies down. 7. Place 3-5 chocolate chips and/or chunks on the top of the cookies. You can flip the cookie dough ball upside down and get the chips to adhere that way. 8. Bake cookies for 9-14 minutes, until ever so faint cracks appear on the surface. I know 9-12 minutes is quite a range, but I find that variations in altitude and ovens really do make a difference in bake times. In my NYC toaster oven, these cookies are perfect at 8-10 minutes of baking. In Colorado, I had to go closer to 12 minutes, sometimes beyond, in the “big” oven, to get the right texture. 9. Let cool slightly (or a lot, your choice, but I can never wait too long to try these). Enjoy! So there you have it. An easy, creative, recipe that is so delicious, you’d never know it’s friendly to many “restricted” diets and actually kinda healthy. Moist, cakey…like a cross between a cookie, a cake, and a muffin. Cream cheese icing optional. I found these cookies delicious without it. Carrot cake is awesome, isn’t it? In cookie form, it’s pretty amazing, too. Especially when the cookie is moist and cakey at the same time, much like actual carrot cake. Bonus: cookies are soooo much more portable than cakes, or even cupcakes. Throw these in a picnic basket or lunch box, and you’re good to go. 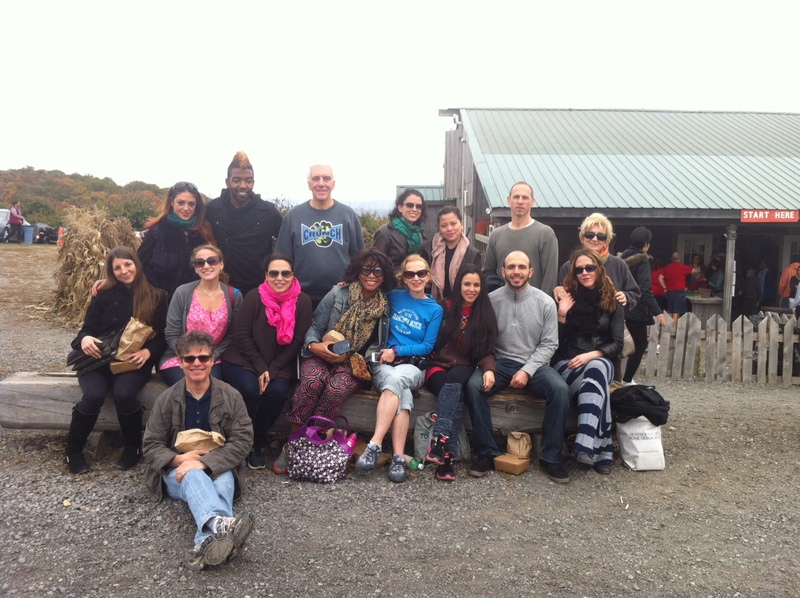 At my last Yoga retreat. 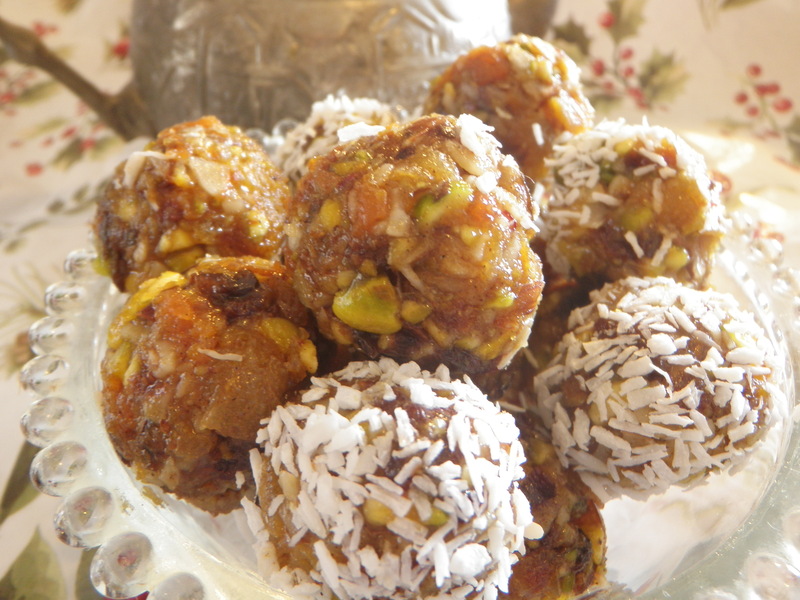 I rigged up this recipe when looking to create a cookie for my upcoming Yoga retreat. I wanted something with fall flavors and a comfort food vibe. I looked around online and found a handful carrot cake cookie recipes. With a few modifications, the cookies easily become healthier, with zero loss of flavor or texture. My carrot cake cookies don’t taste “free” of anything, but they are indeed free of many common allergens, including dairy, gluten, and, if you prefer, tree nuts. Of course there’s sugar, but a moderate amount. There is egg in them, but you could likely leave it out and just do a flax or chia “egg.” (Leave me a comment if you try it to let us know how it goes). These cookies are packed with flavor and a beautiful texture. 1 Tablespoon pumpkin pie spice (Yes, it’s a lot. Trust me on this). 2. In a nice, roomy mixing bowl, mix dry ingredients: oat flour, pumpkin pie spice, baking soda and powder, salt. 3. In a second roomy mixing bowl, cream sunflower seed butter, brown sugar, and vanilla. Once smooth, add egg and mix until smooth again. 4. Make a well in the wet ingredients. Gently incorporate dry ingredients, 1/3 of the mixture at a time. 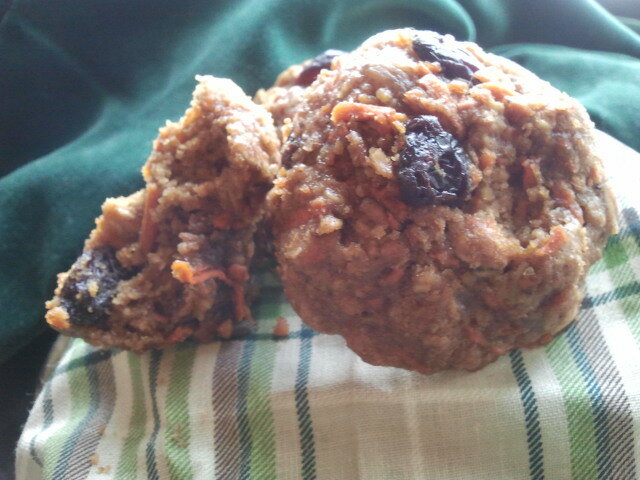 Fold in raisins, grated carrots, oats, and walnuts (if using). 5. Stash mix in the freezer for 10-15 minutes while you prepare your cookies sheets. I either line mine with parchment paper, or spray them with cooking spray. One of these days I WILL get a Silpat. 6. Use a cookie scoop or a spoon to make uniform sized dough balls. (I do this by hand and spoon, and each cookie is a generous tablespoon of dough). 7. Bake cookies for 9-14 minutes, until ever so faint cracks appear on the surface. I know 9-14 minutes is quite a range, but I find that variations in altitude and ovens really do make a difference in bake times. In my NYC toaster oven, these cookies are perfect at 9-10 minutes of baking. In Colorado, I had to go closer to 14 minutes, sometimes beyond, in the “big” oven, to get the right texture. 8. Let cool slightly (or a lot, your choice, but I can never wait to try these). Enjoy! So there you have it. An easy, creative, fall-friendly, carrot cake cookie recipe that is so delicious, you’d never know it’s friendly to many “restricted” diets and actually kinda healthy. What’s your favorite fall dessert recipe? Nutella cakes are easy to throw together. 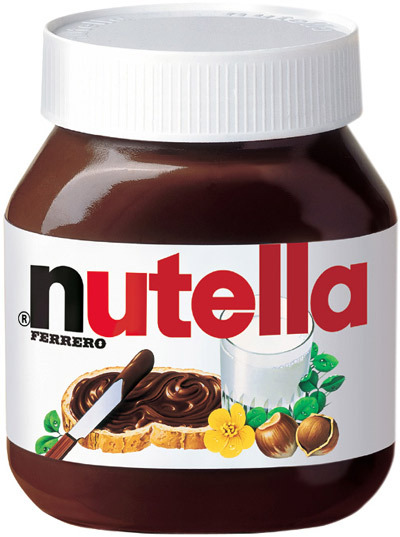 My first memories of Nutella are from way back when, during my first semester at Columbia. That’s when I first tasted this hazelnut and chocolate blend of European origin. I’ve loved it ever since. 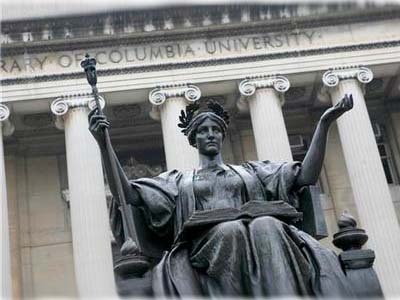 Somehow, it brings back memories of my time at alma mater. For a lot of people, Nutella is the taste of childhood memories. For me, the taste reminds me of truly feeling like adult. On my own, in a strange city, thousands of miles from family, and being fine. Happy even. It also reminds me of one the only phases in my life during which my fridge wasn’t packed. A bit of context: I’ve never truly been That Girl with a sparsely packed fridge. (What a blessing, to have this problem). Anyways, if anything, I’m That Other Girl with both a fridge and freezer that are packed. Packed, I say. To the point that my current freezer appeared to not be working some months back. So I called my super. And he called a repairman. My landlord paid the guy to come out and tell me (wait for it). . .
. . .that my freezer was too packed, and it’d start working again swimmingly if I just got rid of some stuff, already. Oh dear. I’m sure my psychologist friend and I could have a field day with analyzing why I do this to my appliances. Turns out the repairman was right. But I consoled myself by telling myself that my lack of common sense had kept this guy working, at least for part of one day. My own personal contribution to the economy, and during a recession, no less! Nutella! One person’s taste of childhood is another’s taste of emerging adulthood. Nutella (yes, I kept it in the fridge. No I am not THAT dumb. I just wanted to prevent myself from gobbling tons of it at room temp, because, admit it, it tastes better at room temp). And yes, I had a tendency to “fridge” things that really shouldn’t be “fridged.” I’ve learned. I think. My friend dubbed these PMS cakes. But mostly I lived off of cheese, almonds, and spoonfuls of Nutella. And I drank quite a few meals, I must say. Ahem. No ramekins? No problem. 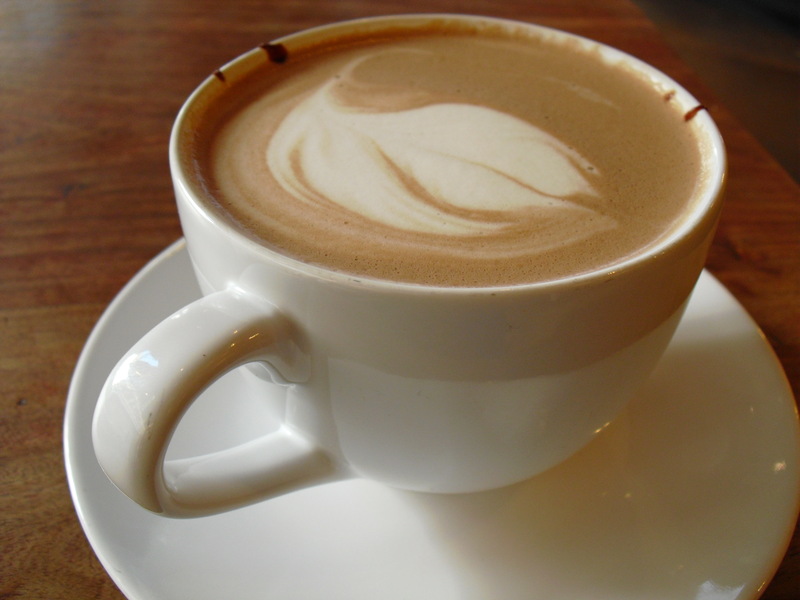 Use small, oven-safe coffee cups or bowls. Yield: 3 to 4 small cakes. Depends on the size of your ramekins or whatever small, oven-safe bowl you bake them in. Recipe can easily be doubled, tripled, etc. 1. Preheat oven to 350 F. As oven heats, in a mixing bowl, combine the flour and milk. Mix lightly until pasty, but still pliable. If too dry, add in a bit more milk. 2. Add in Nutella and stir until combined. 4. Spoon mixture into small ramekins (fill them 2/3 to 3/4 full). Top each cake with a few reserved chocolate chips. Bake for 15 minutes. (Check for doneness after 10-12 minutes, by poking a knife or a fork into center of cakes). Personally, I like my cakes a bit undercooked and gooey, and hey, it’s safe to do that here, because there are no eggs in this recipe. BRIA’S NOTE: If vegan and/or gluten free are of concern, be sure to double check all your ingredients’ labels. Can bake one at a time. Keep the remaining dough, covered, in the fridge. 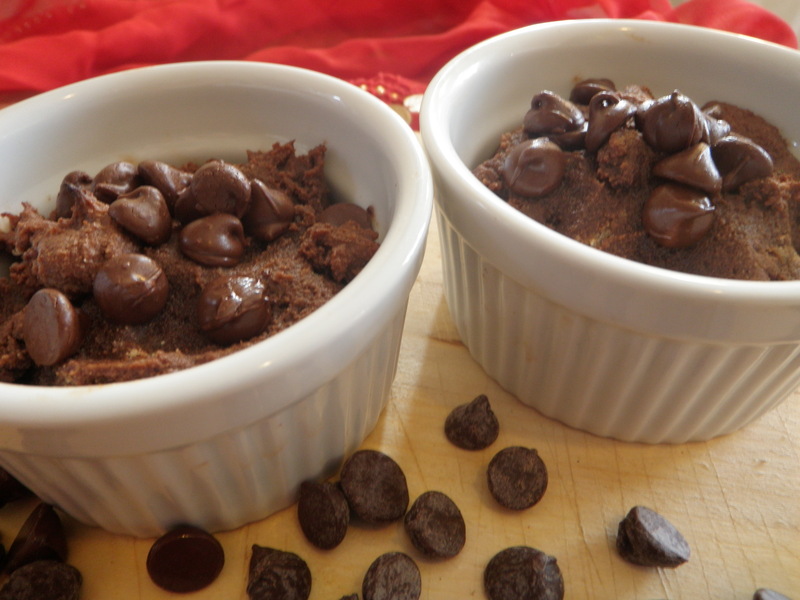 Load up a ramekin and bake when desired/as needed. Because we all need chocolate sometimes, yes? Plus, the one little dessert at time is a very college-like thing, isn’t it? I’m loathe to waste anything. Perhaps this is a Persian thing. Or perhaps not. It’s definitely a “me” thing. Recently, I lucked into a big, fresh batch of medjool dates. They’re creamy, caramel-y, and just perfect. But wouldn’t you know it? I had some other dates lying around that were looking pretty sad. You know I was not going to let those sad, dried out little dates go to waste. I’d feel too guilty enjoying the plump, sassy ones I’d just been given knowing that the dry, pathetic ones were just sitting there, dessicating even more. Ha! So date syrup to the rescue. Me, my student Mythili, and Meera, at the Wanderlust Festival in Vermont earlier this summer. It was one interesting and fun June weekend! Now I have a sweetener for my tea, baked goods, no-bake sweets, and whatever else I can think of. 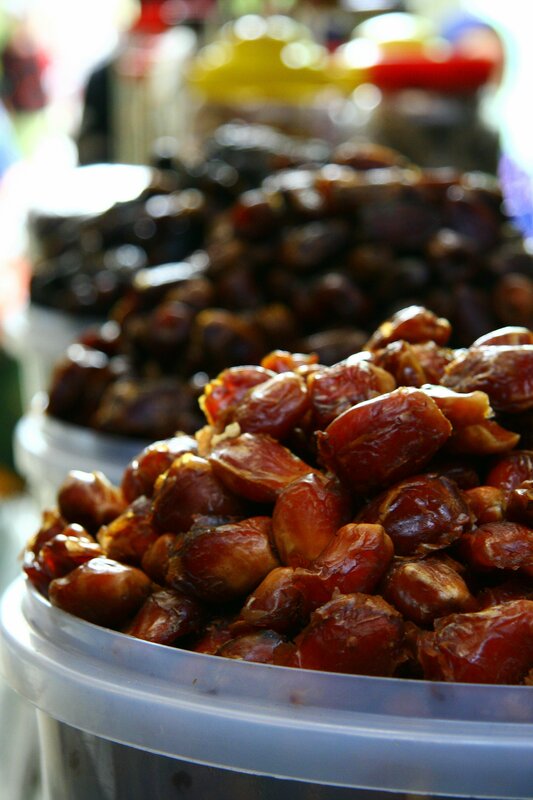 Best of all, it’s natural and makes good use of mineral-packed dates. And I get to snack on those other awesome dates guilt free. Well, not completely guilt-free. I don’t fast for Ramadan. Mad props to those who do, but I don’t. So in an act of restraint, I’ll try not to eat too many dates during the day as the fasting month kicks off in a few days. 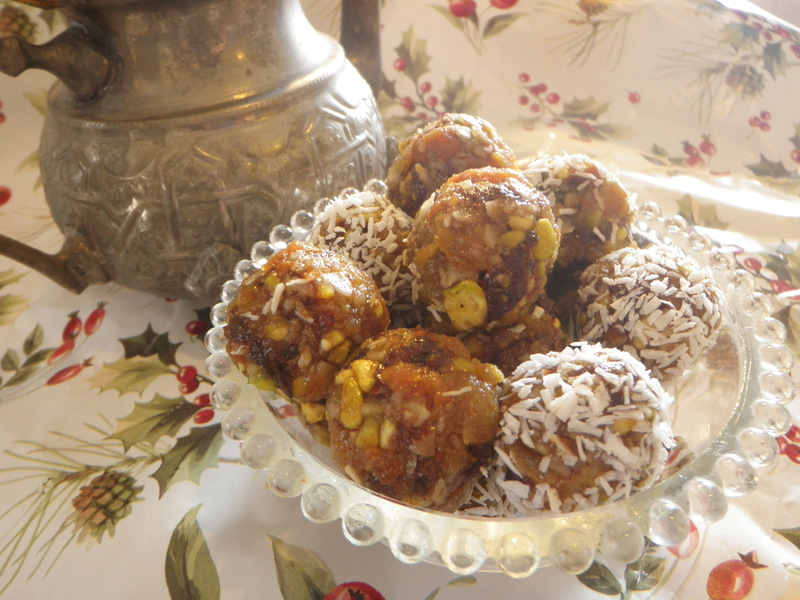 (Dates are a popular food to break the daylong fast with). This yielded a good two cups of syrup. I just blended until it was smooth, which made the syrup liquidy and pourable. If you’re looking for a thicker texture, use less liquid. I’ll be back at some point with a re-cap of some of my summer travel adventures, including my taking to the streets of NY on my bike. But for now, I’m off to enjoy more watermelon, which I’ve been eating tons of lately, and a chill evening. You all take care and stay cool. 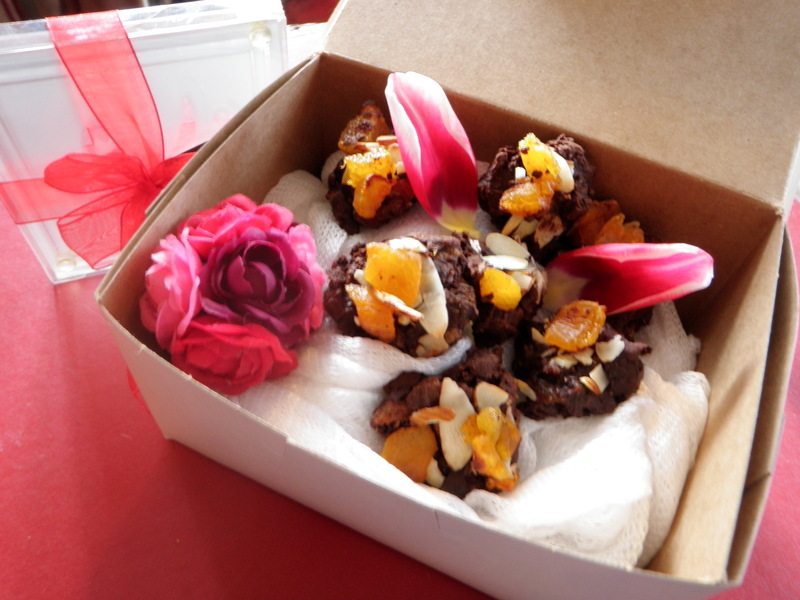 Chocolate almond apricot truffles are an easy cookie to make. Gluten-free flour works in this recipe, by the way (I used Bob's Red Mill). This cake is really molten, to the point of oozing apart like lava. Ha! If you'd rather keep it together, just bake in ramekins to serve. 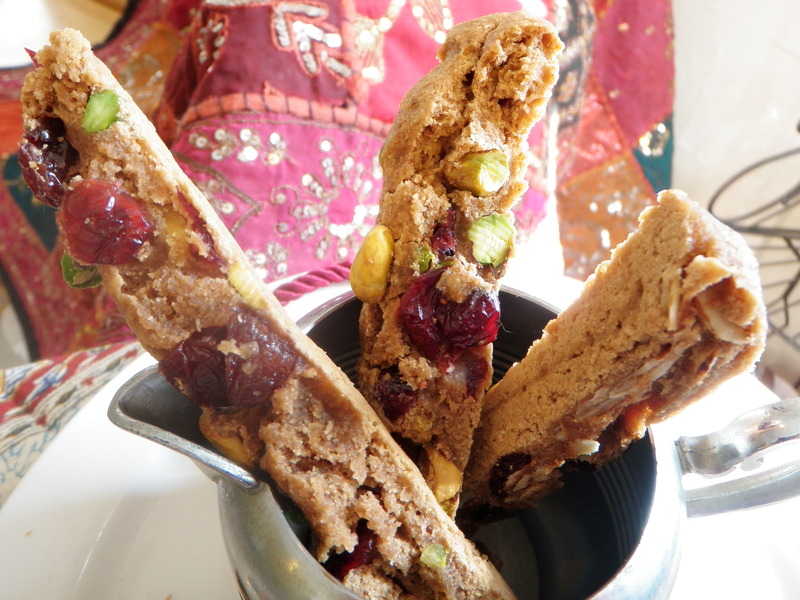 Persianized biscotti. Yes, these cookies could be dipped in melted chocolate, if you're so inclined. 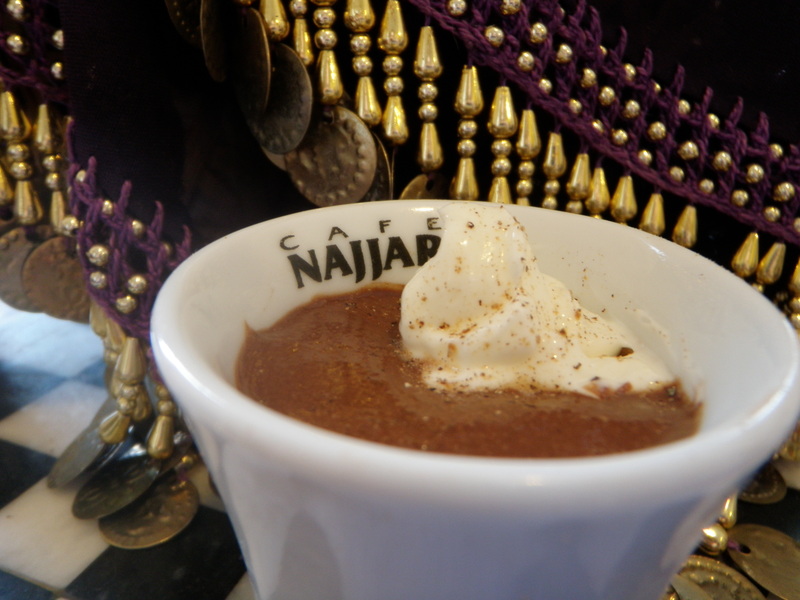 Hot chocolate infused with the finest Persian saffron and cardamom? Win! Petite shots of chocolately goodness! I hope these options help. 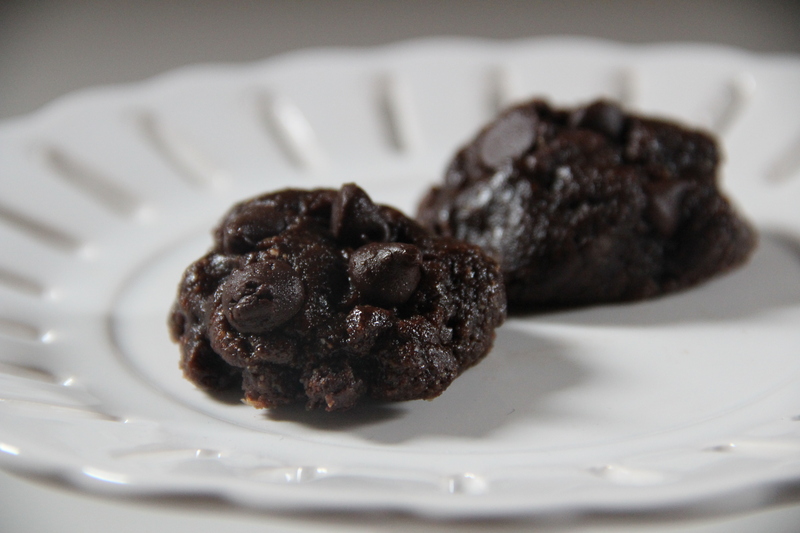 I’m working on one more chocolatey goody, which tastes amazing, and is gluten and dairy free. I’ll post it soon. Chocolate and banana is a winning combo any day. Dunno about you, but the recent events in the Middle East, combined with the relentless weather we’re having here in New York City, make me want to crawl under the covers and hide, preferably with a delicious, comforting dessert in hand. Alas, hibernating isn’t really an option for me, or for most of us, I imagine. 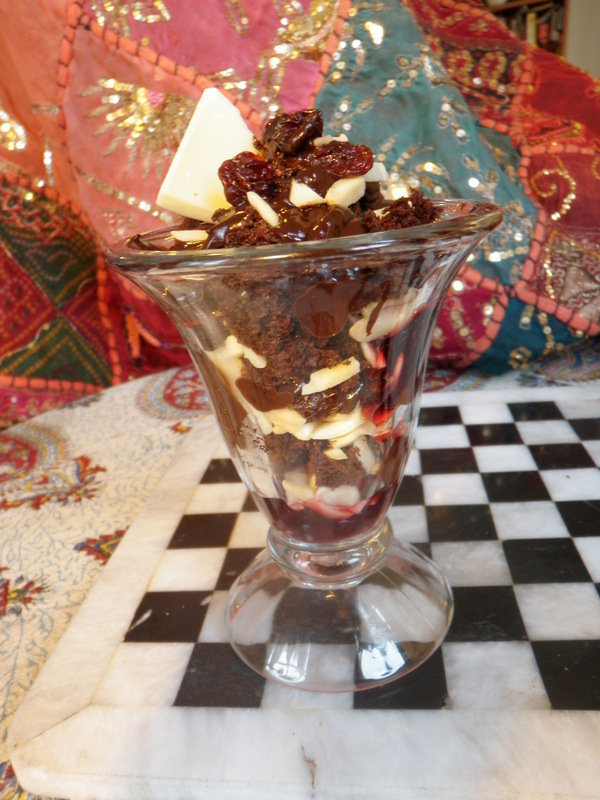 Maybe a chocolate cherry trifle made with leftover chocolate cake? Or how about a creamy, dreamy pudding parfait? Yeah, sounds good to me right about now. Plus, it’s the perfect excuse to bust out my parfait glasses. But. . .
Making pudding from scratch certainly not my thing. In the immortal, hyperbolic words of my friend Denise, it “ruins my life.” Yeah, safe to say that custard making and I don’t get along. Ugh, I simply hate making custard. It always breaks or curdles on me, and frankly, I have limited patience for endless whisking, or for recipes that take too much time. 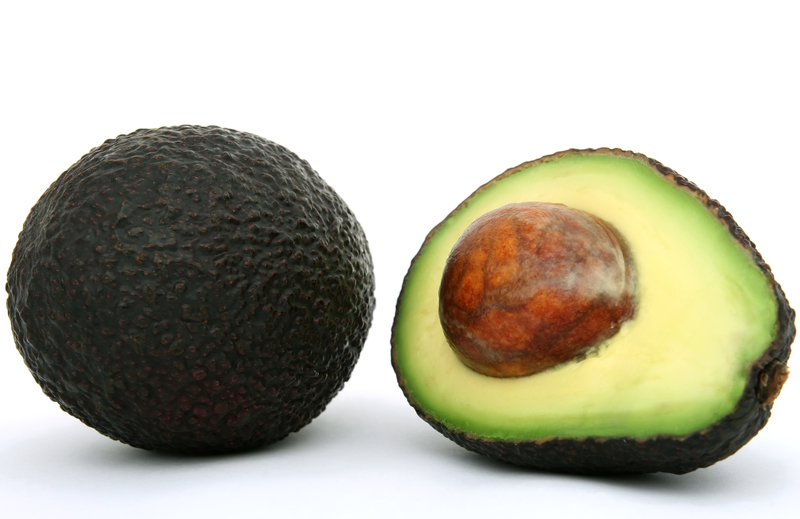 Avocados are the surprise ingredient in the easy, fast, chocolate pudding element of today's recipe. 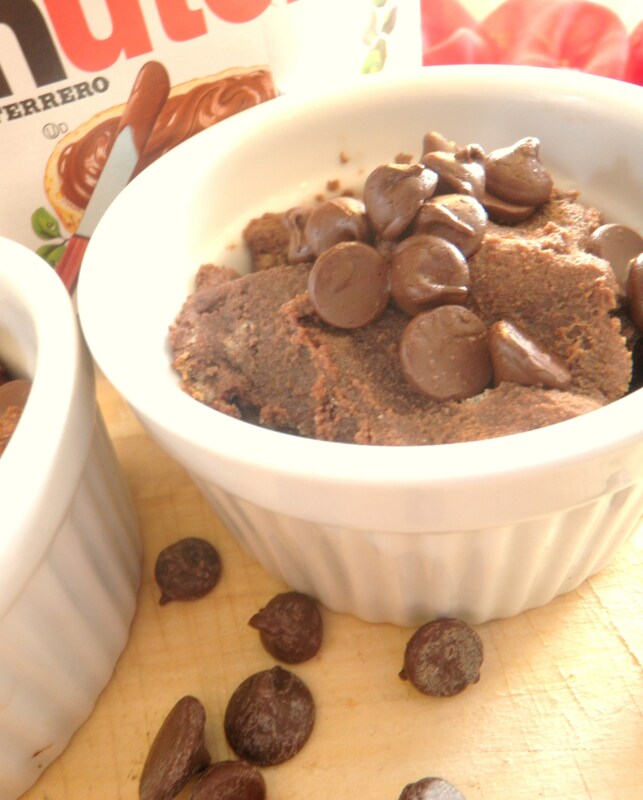 Vegan chocolate pudding? Yes, it does exist, and it's easy to make. 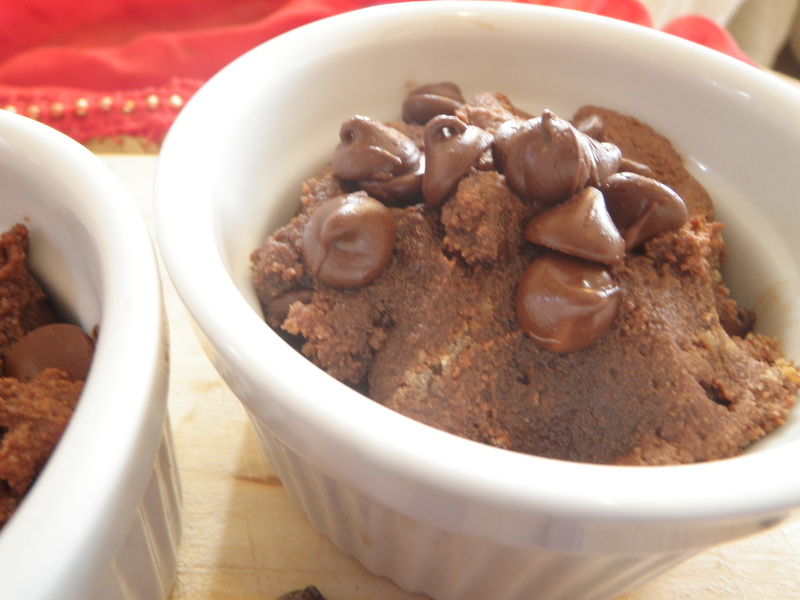 The bananas in the chocolate pudding give it sweetness, so go easy on the added sweetener (taste as you go). 1. Make banana pudding according to package directions, adding 1/2 of the cardamom powder to the mixture as you blend. Place in the fridge to chill for at least 5 minutes while you make the chocolate pudding. 2. In a blender, place flesh of avocados, chunks of banana, cocoa powder, remaining cardamom powder, sweetener (if using), and a splash of coconut milk or water to help things blend. Now blend until smooth. Add more cocoa powder if you need to thicken. Thin it out with liquid if needed. Test for sweetness, and add more sweetener if needed. 3. Make sure banana pudding is set and “scoopable” with a spoon. 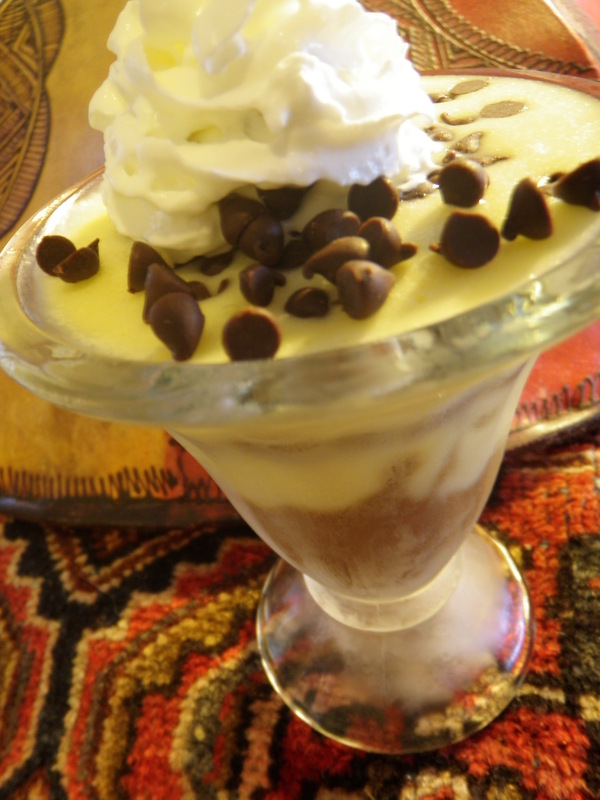 Once it’s set, in a decorative parfait glass, layer puddings in alternating layers, starting with chocolate pudding first (it is denser than the banana pudding). End with a layer of banana pudding, then top with garnishes of choice, if using. Settle in under the covers or on the nearest couch, and enjoy.